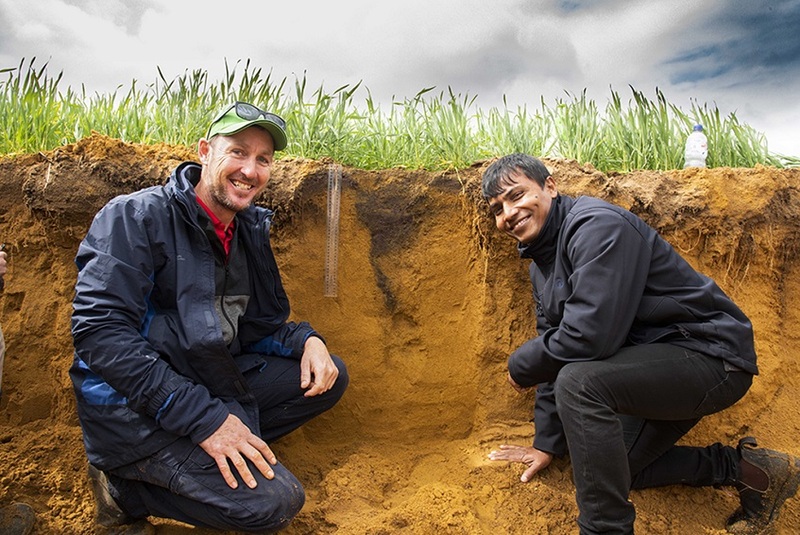 Kalannie grower Bob Nixon with the DPIRD researcher Gaus Azam discussing the effect of applying both lime and gypsum to acidic soils. GROWERS in Western Australia’s low rainfall areas with predominantly acidic soils have the potential to increase wheat yields by up to 30 per cent by combining lime and gypsum applications to their soils. Ongoing research by the Department of Primary Industries and Regional Development (DPRID), in collaboration with the University of Western Australia, is demonstrating that applying lime and gypsum together can be more effective in improving grain yield, than applying either soil ameliorant individually. DPIRD researcher Gaus Azam said while both lime and gypsum could have a positive effective on yield when applied individually, research was showing the combination of both ameliorants provided better results by increasing soil pH and improving the uptake of nutrients. “Lime assists to increase the soil pH and decrease aluminium toxicity, which in turn improves the uptake of water and macronutrients including calcium and magnesium,” Dr Azam said. The research, invested by GRDC, has been underway for two seasons – 2017 and 2018 – on trial plots sown to Mace wheat in Kalannie. Soils in this area are naturally acidic. The trials not only looked at the effect of lime and gypsum application on soil, but at whether it was more effective to incorporate the ameliorants by tillage or apply them as a surface application. Dr Azam said for the 2017 season, yield results for trial plots where lime and gypsum were incorporated by tillage treatment were not as good as a surface application. “Applying six tonnes of lime with three tonnes of gypsum as a surface application produced 30 per cent more grain or 1.04 tonnes per hectare (ha) grain yield, compared to the untreated control of 0.79 tonnes per ha,” Dr Azam said. “However, the 2018 results showed a change with lime and gypsum applied with tillage treatments, especially when applied at higher rates, outperforming the surface application. Dr Azam expects incorporation of lime and gypsum together might continue to produce better yield results than surface application, as incorporation rapidly increased pH, reduced aluminium toxicity and increased nutrient uptake. The research will continue until the end of the 2020 season.